FlashGet English v2.11.0.1186 without Ads FIXED: auto take download links by click. Download Links on Websites up to your config, start FlashGet and catch them to download. Catch on Weblink, Catch all files on site. Filter can be set what file types (extensions) should be downloaded. 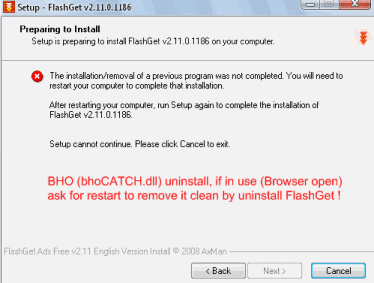 Delete by uninstall if Webbrowser is running FlashGet BHOCatch (bhoCATCH.dll) on restart. Version without 'Security' Module: Your AV scanner run in realtime mode. Monitoring new files is not necessary. Q: Why an installer version? A: because FlashGet needs regserver to register the bho and set the needed registry keys. The installer is also needed to complete remove the application. FlashGet.exe set by self some registry keys into the Windows Registry which the installer by running uninstall removes. Q: Does it install any Ads, popups or embedded Toolbars as in the Original FlashGet Setup? A: No 3th party Addons, Toolbars and Advertising Modules are include! FlashGet.exe is modificated to send no stats and receive no Ads (Related links etc... frames around the GUI), upload video preview feature removed in flashget.exe, the Option settings enable/disable upload video get ignored. - Modules: SnapShot, Downstat, garage, SearchTop, SoBar include the Skin extras for SoBar, Chinese Language Files. A: FlashGet is on many websites promoted, each version have different "addons" - 3th party Banner and Ads in them setup. Remove Flashget using the original installer from that version you did install it. Check in add/remove programes under system control panel for Toolbars, uninstall them. Run regcleaner (CCleaner or simulary). Check with regedit a search for keyword: flashget, remove all founded entries. Delete after uninstall and regclean Flashget's program dir include sub directories. Install this clean Version. Q: How to download with FlashGet from other Browsers: Opera, Safari,...? A: Start FlashGet, right click on the download link in Browser, select in menu copy link. The link will be taken to Flashget from clipboard.